While our usual fair is more extreme weather than this video depicts, there are some lessons for us here as well, not the least of which is the efficiency at work you are about to watch on your computer screen. The video was shot by Brian Rickard on a recent cruise with the Henrys aboard the FPB 64 Sarah Sarah, in British Columbia. Sarah Sarah has a full payload of the Henry’s gear aboard and half tanks. She weighs around 80,000 pounds / 36,000kg, and is running at nine knots through the water (net of current). This is a speed length ratio of 1.15, on the low side of where the FPB 64s normally operate in smooth water. There are a series of views, almost all from off the boat, taken in smooth water so we can study the wave patterns. Brian, who also edited this video, has used slow motion and cropping to enable the viewer to get a feel for the magnitude of the disturbance as Sarah Sarah goes about her business. There are three immediate, and familiar items that we noticed. 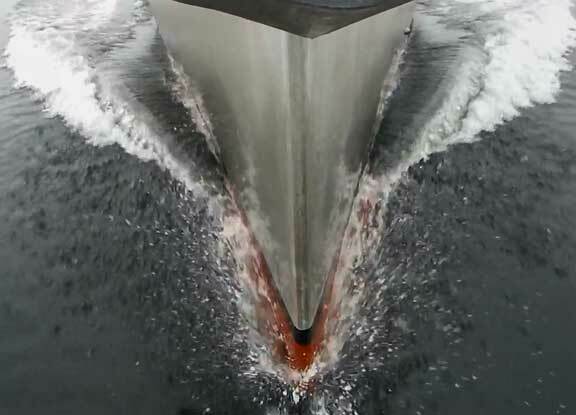 The bow wave is almost non existent, there is a very slight hollow in the area of the stabilizer fins, and the stern wave is well suppressed for a yacht of this displacement. The more efficient the vessel for a given speed length ratio, the less power that is required and the greater than range from a payload of fuel. Lower power equates to quieter running with less vibration (Passage Maker former editor, Bill Parlatore, wrote of his sea trial aboard Wind Horse she was “the quietest yacht he had ever measured” and this at eleven knots). Lower smooth water power requirements leaves more engine for fighting headwinds and big seas. The recent example of Avatar’s passage with gale force headwinds, on her way from Fiji to New Zealand, with a 100% power margin, bears witness to this benefit. Sarah Sarah’s trip from Hawaii to Puget Sound, averaging ten knots for the entire voyage (a speed length ratio of 1.28), is another example of what efficiency can do. This entry was posted on Sunday, October 30th, 2011 at 12:00 am and is filed under Dashew Logs, FPB 64 Videos, Right Sidebar Latest Videos. Both comments and pings are currently closed. It appears that there is a secondary bow wave coming from somewhere near the first third point along the hull. Looking at the hull shape (realizing that your curve of area is a bit of a secret), does your hollowing of the forward sections lead to a place where the hull is pushing water out of the way faster and faster and giving rise to a secondary bow wave? It seems that if you were able to do that it would fill in a bit of the typical trough that happens in the middle of a typical hull. Is that part of the strategy or even a valid observation? First, no comment. Second, it is hard to get a detailed sense of what is happening because of wide angle lens distortion. The curve of are or forward and aft prismatic relationships are indeed critical. I understand the need to keep the results of all your hard work close to the vest. Given the results at the ARC and the numbers on the 64’s there is no doubt that some will try to flatter you in the traditional way- imitate.